So many of you might be wondering what we’ve got up our sleeves for the immediate future. While the entire team has been busy polishing up the tons of game modes, characters and other shenanigans bound to be released in the upcoming Winter updates, there were certain moments when we decided we might also need to take a step and look through some of the features that have been part of the game for almost 2 years since release. One of the things that we’ve been wanting to dust off and also give a good scrubbing was the Steam-based inventory integration that we have up and running for the game at the moment. As you might be aware, the current system has you fully unlock modes, characters and mutators by playing the game (jeez, I know, right? Who would’ve thought! ), and then stores them for you outside of the game, within the Steam Marketplace inventory system. Now, meetings were had, voices were raised and donuts were consumed, but in the end we reached a unanimous conclusion that this sort of system was just not intuitive or fun enough for Move or Die anymore. Thus, it needs to pack its bags and move on. Now, you might be asking what this means for you and your vast collection of Pootpoots. While on the team’s side this change is pretty massive, you guys shouldn’t feel (almost) a thing! A new freshly designed in-game inventory system will be taking its place, making the whole experience easily accessible and much more enjoyable for those playing the game. An issue that immediately came to mind was the randomness of the reward system. While we still consider random unlocks to bring an element of excitement to the game, the new system will solve the issue of duplicates, and you also won’t lose any value from existing duplicates. This means you won’t be able to hoard hundreds of that one character you like so much. On the other hand, you also won’t have to spend 500 hours praying for Chainsaw Backstab. There also won’t be any downtimes or resets during this transition. What this means is that once the old system is out, the new in-game system will be implemented at the same time and you won’t lose any of the progress and unlocks you have in the game, up to that point. 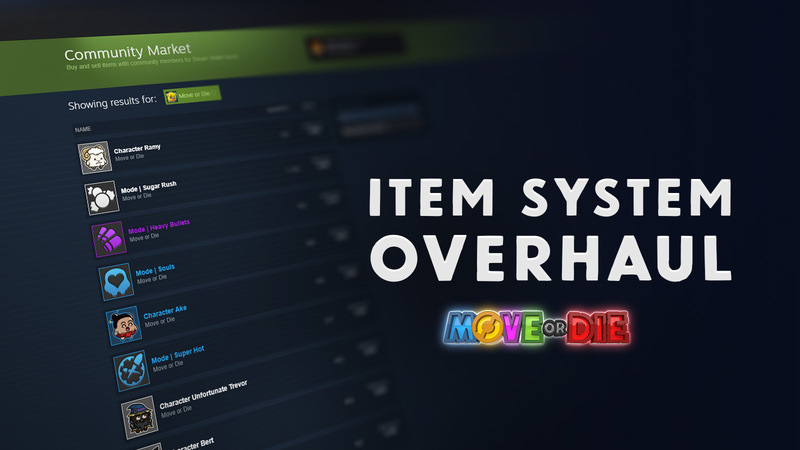 All the Move or Die related items that you currently have attached to your Steam account will instantly be converted to the same items within your new in-game inventory before the end of the year. This change is part of a new system where progression is achieved by playing and where every aspect of the game is easily accessible and understandable by all you awesome people who play it. I like some the new inventory ideas but can you guys keep integration with Steam Inventory and Community Market? I like being able to trade items with other players with Steam Inventory features. Any new game modes? or anything about mod for creating new game modes? Hence a regular app testing must be conducted to order to ensure long-run survival as well. After printing, a mistake arises SPLWOW64.EXE. When the consumer uses the Amyuni Document car owner for the Sage 50 version, there may be issue arising with MicrosofT company Microsoft windows 10. For MicrosofT company windows 10 & IE 11 Users: If you are a frequent customer of Online Traveler 11, then one factor you should know properly that in IE 11 TLS 1.2 is allowed automatically, so you need to validate TLS 1.2 is allowed. Excel 2019 adds powerful new information analysis functions, such as new formulas and charts and enhancements to PowerPivot. Word 2019 and Perspective 2019 help you concentrate on what matters most. Learning Tools, like Study Aloud and Text Spacing, makes it simpler to engage with your material. Aol E-mail is a no cost electronic email administration provided by Aol (Formerly America Online). The email Support provided by Aol is fully secured from junk and viruses too. Aol provides outstanding Support for its customers. Their main objective is to provide the best service worldwide with 100% fulfillment. You have a number of choices to interact with Webroot phone number representatives through offline and on the internet. If the above technique fail to fix the file error, try operating an anti-virus application to check out your PC for harmful programs. At periods, a few harmful programs invade into your PC and tend to remove dll files. QuickBooks Pro has both of that offline an internet-based technique that in the function should you goes browsing or offline. It will eventually not appear any problem there. We use a proprietary technology from QB for developing this understanding seamless and to be sure you haven’t any concerns. Host QuickBooks inside our planet course facts Heart that may be SOC-2 Licensed, and let us manage the servers! Office 365 ProPlus, the cloud-connected edition of Workplace, delivers the most productive and safest Workplace experience—with the lowest sum total of ownership for implementation and management. One of the errors is desktop laptop or computer pc mistake system code 212. Aol Desktop mistake system code 212 is this is the im mistake. It usually generates while providing the e-mail via the courier by using software. It starts from the Aol. When client wants to provide a message to any other client but there are some issues by which you are not able to do so. A trojan is a dangerous system that replicates itself by inserting its copies into more information and programs, on execution. Hence, corrupting the original information files. Therefore, it is crucial to install anti-virus program in your pc.
. Accept expenses from several avenues like Credit Card, Debit Card, Money and more.
. Reconcile all the prices from the program within.
.	Look for Customer background choices. Intuit Press Announcement said that as of March 2008, a lot of retail units in the company accounting bunch contacted 94.2 percent, as per NPD Group. It furthermore says in excess of 50,000 bookkeepers, CPAs and automatic company consultants are individuals from the Quicken ProAdvisor program. 	Log in to your system with Administrator rights. 먹튀사이트 Just want to say your article is as astounding. 스포츠토토 This is a topic that is near to my heart… Best wishes! Identify what keywords you’re going to use before submitting your app to the app store. This will help produce more traffic (views and downloads) in the upcoming. The following requirements should be kept in thoughts when determining keywords. 24×7 round o clock.feel free to contact us. The high value to be set upon the Maid’s replies is well known; they are heroically sincere, and for the most part perfectly lucid. Nevertheless they must not all be interpreted literally.